… it’s that time of year once again when the life of a food blogger becomes a battle of light and dark. It may be 9 years since I started this blog but I’ve never quite worked out entirely how to deal with the fading light of the winter months. As it happens we’ve had some incredibly bright and sunny, if very cold days recently and the light has been exceptional but at 4pm it’s dark. End of story for me. I do have a couple of exceptional lamps for photographing food but there’s something about the final image that just isn’t the same as when I have natural light coming in. I also have very little time to play with anyway, usually doing all my blog cooking for the week at the weekends so I end up in a baking frenzy just so i’m finished in time to capture it all in the fading light. I’m kind of fine with it now. It used to stress me out quite a lot but over the years i’ve learnt to be at ease with my blog / life / work balance and live with it… but every now and again I do get annoyed when I feel I haven’t captured how divine the food looks, particularly with something like these pasties. I had a lovely rustic image in my mind but I didn’t end up with that vision… thank god they tasted heavenly! 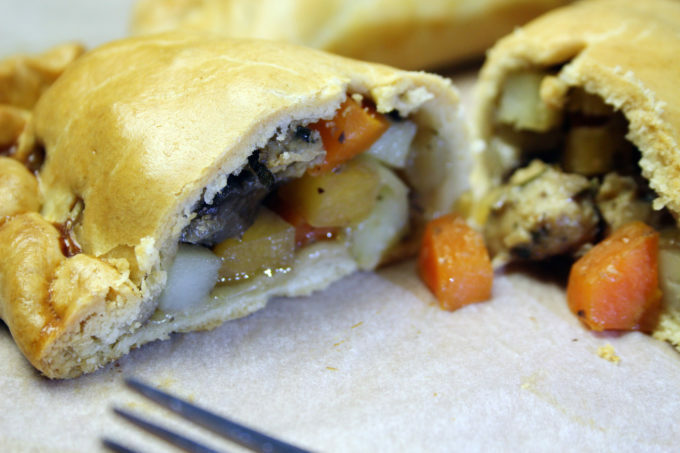 I have never made a ‘Cornish’ pasty and last weekend I found myself with a surplus of root vegetables and bored of my usual run of autumnal recipes I thought something a little different would be nice. I have no idea what made me think of pasties but I think it was the swede that clinched it. I adore swede as a vegetable and it’s often overlooked in the greater scheme of things but it has such a wonderfully sweet and earthy taste. Of course I made these vegetarian with the use of veggie sausages (I used Cauldron Food Lincolnshire Sausages this time and they worked beautifully) but you could just as easily use meat sausages which would be lovely. I was most impressed with the quality of the pastry. The recipe calls for a strong white bread flour because you need a robust pastry to hold all the wonderful filling inside and so that, as would have been the case historically, you can hold the pasty in your hand without it crumbling. 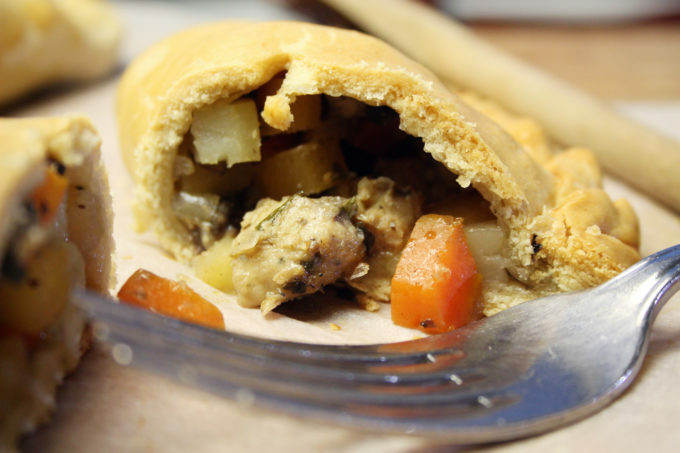 It was a delicious pastry and in fact the whole pasty was quite successful, so much so that i’m thinking of making a ‘Christmas’ version with stuffing for my vegetarian guests on Christmas day. 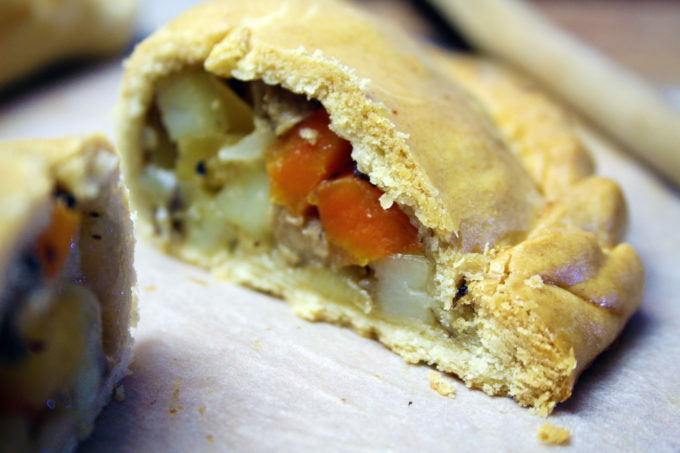 this recipe is enough for 6 pasties. start by making the pastry by placing the flour, butter and salt into a bowl and rubbing together lightly until it resembles breadcrumbs. Then add the water and bring the mixture together and knead until the pastry becomes elastic – roughly 2-3 minutes. This will take longer than normal pastry but it gives the pastry the strength that is needed to hold the filling and retain a good shape. cover with cling film and leave to rest for 2-3 hours in the fridge. This is a very important stage as it is almost impossible to roll and shape the pastry when fresh. place all the filling ingredients into a large bowl, season really well and mix together until well mixed. roll out the pastry and cut into circles approx. 20cm diameter. A side plate is an ideal size to use as a guide. Layer the vegetables and sausage mix on top of the pastry, adding plenty of seasoning. 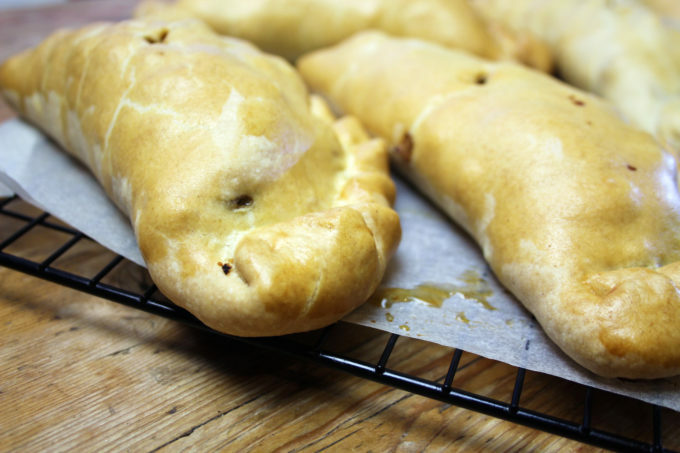 bring the pastry around and crimp the edges together – I referred to the experts from the Cornish Pasty Associated and got the below method and photo story for you. It’s actually not that easy but by the 6th one I had it down… I think! Lightly brush the edge of the pastry with water. Fold the other half of pastry over the filling and squeeze the halfcircle edges firmly together. Push down on the edge of the pasty and using your index fingerand thumb twist the edge of the pastry over to form a crimp. Repeat this process along the edge of the pasty. When you’ve crimped along the edge, tuck the end cornersunderneath. The finished pasty, ready to bake! glaze with beaten egg or an egg and milk mixture and then bake at 165C (fan oven) for about 50 – 55 minutes until golden. eat and of course, enjoy!.. and if you happen to be in Lincoln this weekend, don’t forget i’m demo-cooking at the Lincolnshire Food and Gift Fair at the Lincolnshire Showground on Saturday and Sunday! I know what you mean about the light Dom…… It almost becomes too frustrating to make anything, because I leave the house before light and get back after dark…… the weekends are too short! thanks! I made them again last night and what took me an hour the first time took 10 minutes last night and the crimping looked great!